Facebook has made changes recently that make it possible for third-party apps (like Sonlet) to post to groups where the user is not an admin. This is especially important for groups where you've exceeded the maximum admin count allowed by Facebook, for example. As a nice little side-bonus we've also added the group photo to the drop-down to help you locate your groups more easily. 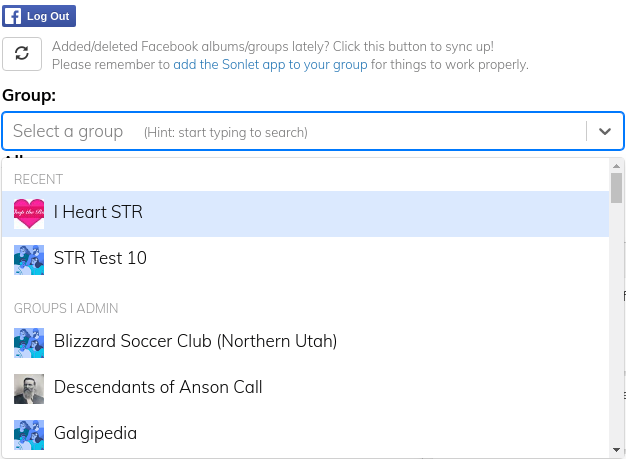 You can also type to search your groups by name. The "Quick refresh" option will just refresh the groups that you admin. The "Full refresh" will refresh all of your groups.